On my uncle’s farm in Parma, there was always a swing seat or ‘il dondolo’. We would fight to sit on it and it seemed so much luxurious than a sum of its parts – basically a garden seat which could swing (swang?). For the first four decades of my life, I never had so much as a scrap of garden. I had a window ledge, on which I could have balanced a plant pot, over the heads of the litigious, but I was not brave enough. In my childhood flat, I did have wide window sills, atop which I would grow pot plants. I was master of my miniature world but somehow this has not translated into my adult life (I know nothing about gardening, it really is like a language I can’t speak). Anyway. When I got me a garden I went slightly mad with all the things I always wanted, but never had. All manner of garden games, climbing frames, slides, swings. And finally, a swing seat. I got my first one six years ago. I went for beauty – wooden – with a cream awning. Mistake. Sure I could put cushions on it but it wasn’t really built for comfort, more perching and thinking “isn’t this wooden structure so, wooden?” Then, after a few winters, the cream awning went green and ripped. So when my friend Meg got a swing seat which she talked about with love – how comfy it was, how much it had changed her life etc. I stored this piece of information away in the back of my head. This year, come April I was in there, at B&Q (from whence it came) to see if it was as comfortable as Meg said. “Don’t they do it in any other colours?” my partner asked, pained expression on his face. I caught him one day looking up more classy swing seats – they exist but my God do they cost. Anyway, true to what Meg has said, this is so comfy. It sits outside the back door and whenever I have a moment I go and sit or lie on it. Sometimes I work on it, legs outstretched, laptop where it’s meant to be. I’ve also fallen asleep on it. It’s a relatively small thing which has added to the pleasures of life. It augments sunny days and we all sit on it after school’s out. It’s been a really good purchase. I even let my partner sit on it (he did assemble it after all: which took a couple of hours). Sure you have to take the cushion in if it rains heavily. And in the winter it will need to be striped down (awning and cushions off), but in the meantime, it’s everything you’d want in a swing seat, at a good price. Have I mentioned how comfy it is? And it has a small table upon which you can balance, you know, whatever you want that’s small. My friend Karen has an Old Rocker – and by gosh they are beautiful and Karen saved up and deserves it – but they cost lots. Too much for me. But, for the money you can’t beat this one from B&Q. Trust me I’ve looked. 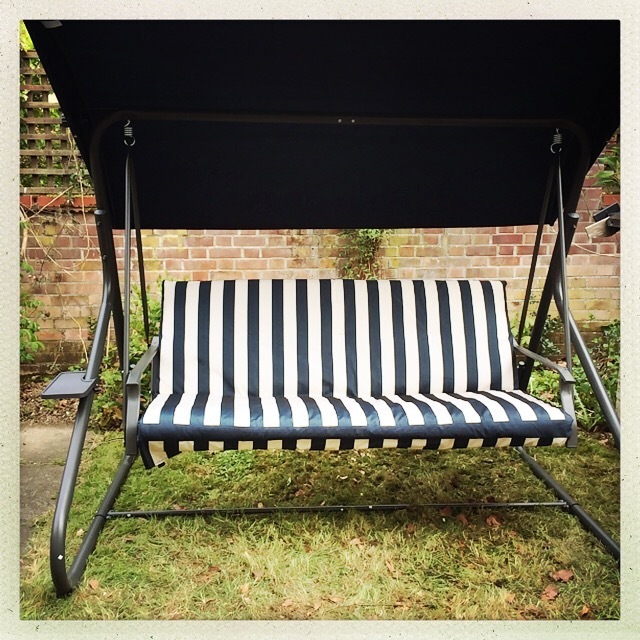 This entry was posted in Consumer and tagged dondolo, garden, garden furniture, swing seat on June 8, 2015 by Annalisa Barbieri.